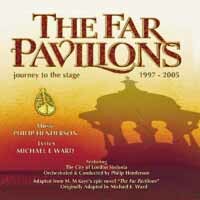 Creating a musical from M M Kaye's best-selling novel THE FAR PAVILIONS took writers Philip Henderson and Michael Ward eight years. These unique studio recordings sung by some of the finest performers of British musical threatre between 1997-2005 represent the milestones they passed on their way into the West End as plans for a production seemed to stall then suddenly gathered speed. It was a journey, by turns joyous and painful, but one they would never have missed. Philip and Michael are delighted to share that joruney with you.